Appendix A: Notes on Chronology. The information below is a collection of various observations related to chronology developed in more detail than would have been appropriate as endnotes in the main text pages. I should also note that I rather indiscriminately mix historic and astronomical dates for antiquity and almost always list astronomical dates in BC notation. Astronomical dates are normally shown as, for example, "-747," which is the historical year "748 BC," but I often list this as "747 BC." In a few instances I quote dates from antiquity in the Julian calendar, but most times the dates refer to a backward extension of the Gregorian calendar. In a few cases, where more exactness might be called for, I have differentiated these. In all cases the dates before 747 BC are in solar years rather than an actual count of days on the Julian or Gregorian calendar. The reason for using solar years is explained in the chapter "The Maya Calendar" and also further below under Carbon-14 dating. Additionally it should be noted that years in antiquity for the Eastern Mediterranean region differ by 4 years from actual years from Assyrian times through late Roman times (at least) and thus also differ from calculated years for China and Mesoamerica which are true to a real-time calendar. This has been known since the 19th century, but has been neglected by historians as too difficult to correct. For ephemeris calculations during this period I therefore have to select dates 4 years earlier, and sometimes five, to compensate for this error and additionally for the lack of a "year zero" among historians. Additionally, dates on antique calendars are often at variance because different nations start the year at different seasons. Earth, on an orbit laterally offset from Saturn, made electric contact with Saturn in 10,900 BC, causing an initial 1500 years of cold, but extending to 2500 years of shadow. This incident is discussed by Firestone, et alii, in 2001 and 2007 in two papers and a book. The initial 1500 year period represents the coldest climate the Earth has ever experienced. Large animals disappeared from the Earth. The Clovis Point culture of America ended. This was also the universal "darkness at the beginning of creation" of mythology. The dates are from climatological records, and are for the northern hemisphere. In the southern hemisphere (which is largely tropical) the Younger Dryas ends a few hundred years earlier. 10,900 BC -- The start of the "first creation"
Earth entered the coma of Saturn in 10,900 BC. A massive compressive shock placed minute carbon particles into the stratosphere. The Peratt column developed at this time along with the southern plasmoids. The date of 10,900 BC is thus the start of the "first creation" as can be inferred from the texts of some Maya stelae and from physical conditions. This is the "creation" noted as "the first image of the turtle." The turtle is the far southern plasmoid of the Peratt Column. The placement of the "three stones" likely represents the same objects. These are the only references to an earlier event ever represented on Maya stelae. This date is long before the date of 3147 BC. I have used 3147 BC instead of 3114 BC after taking into consideration how the Olmecs instituted the Long Count in 747 BC. "And then the past epoch ended. On 4-Ahau 8-Cumku [August 13, 3114 BC], 13 Baktuns were completed." "On 4-Ahau 8-Cumku, was (first) seen the image of the turtle." In the philosophy of the Maya, all events cycled through periods of time, so that the event of 13.0.0.0.0 was equivalent to the event of 0.0.0.0.0 -- 5200 years earlier in 8347 BC. The date of 3114 BC for when "the epoch ended" was added to the above inscription by archaeologists. It is confusing that two periods both ended at a count of 13 Baktuns. This is true especially to archaeologists. Only because we learn about the image of the turtle, can we jump to the conclusion that this was meant to designate the end of the "first creation" in 8347 BC. That the predecessors of the Olmecs had kept tallies of years since before 10,900 BC, is certain from the contents of some books of the Chilam Balam and clear from the Popol Vuh. This year (10,900 BC) can also be assumed to set the date for the earliest Peratt column and the ball plasmoids of the south. 8347 BC -- End of the "first creation"
The "first creation" ended in 8347 BC when a count of 13 Baktuns was reached. The count of Baktuns had started in about 19,000 BC. The southern ball plasmoids came to an end in 8347 BC. The period after 8347 BC would be known as the "second creation." By coincidence, a total of 13 Baktuns passed before 3147 BC was reached. In 3147 BC the polar configuration came apart, and a third epoch started. After about 9000 BC, when the effects of the Younger Dryas ended, the climate improved markedly in the northern hemisphere since the Earth's orbit was considerably below the level of Saturn and the Sun. In the northern hemisphere the Sun was higher in the sky throughout the year. Tropical and temperate climatic zones started to move hundreds of miles north, moving the tropical wet zone to the level of the Sahara, moving the dry zone into the Mediterranean region, and improving conditions at the north polar regions. In 4077 BC Saturn went nova and started to blaze. The coma of Saturn dropped, and Saturn and the intermediate planets Mercury and Mars were clearly seen. A plasma stream from Saturn reached to Earth. This would have been a radical change in the celestial environment, but no notice is taken of this (as I currently understand it, except in the Popol Vuh). The last 1000 years of this period is what we call the "Era of the Gods." I originally used 3114 BC as the date for the end of the "Era of the Gods" because it was a well-known date derived by retrocalculation from the Maya Long Count calendar -- even though it is based on the projection of our current Gregorian year into remote antiquity, and would thus be incorrect by 34 years. I have changed this in favor for 3147 BC, a value correct in terms of solar years. It is based on subtracting 6 Baktuns (400 year periods) from the date of the inception of the Long Count in Mesoamerica on February 28, 747 BC (-747), which is listed as 6.0.0.0.0 in Long Count notation. The date of 3147 BC (or, for that matter, 3114 BC) more or less matches the start of eras elsewhere, as in India. It predates the first Egyptian dynasty by 50 to 100 years. It also coincides with a marked lapse in cultural development in Northern Mesopotamia, and it predates the first kings of Kish in Mesopotamia (as developed below). Additionally it seems to mark a change in climate worldwide, today called the Hypsithermal. 2349 BC -- The end of the "third creation," the "flood of Noah." The date is from the chronology developed by Bishop Ussher, in The Annals of The World (in AD 1650), and represents the date he assigned to the flood of Noah, even if there was no flood, or Noah. The date is convenient in that it is well known among Bible chronologists. The date also matches, within a decade or so, the chronology of China (as developed by the Han dynasty in about AD 200). The brief records of Mesoamerica as reported in the Chilam Balam are not accurate on this, however, although the reason for this is easy to find. Events and celestial manifestations for the date of 2349 BC (or something close to it) certainly match across all continents, all in terms of a giant plasmoid (a "dragon") arriving from Venus, seen and recorded in turn by India, the Middle East, Egypt, Mesoamerica, and China. The worldwide assignment of the culmination of the Pleiades to mark the remembrance of this event in early September, when Jupiter made a sudden reappearance on the third day, also depends on this date. There are, in fact, four electric additional contacts by Venus during this period of 2349 BC to 2193 BC, 52 Solar years apart. The last, of 2193 BC, brought a 200-year climatic downturn to Mesopotamia and Egypt. This last event is fairly well dated from archaeological sources, and thus validates "2349 BC" if the 52-year intervals hold also. The number of so-called contacts or near contacts with Venus can be surmised from Egyptian and Mesoamerican sources -- some only depicted graphically. The date is from Immanuel Velikovsky, in Worlds in Collision (1950), and is verified from numerous medieval chronographers to within a year or two (and even by Josephus in AD 100). Moses can be placed to the time of the 12th Egyptian dynasty if the one "Sothic date" for Senusret III is dropped as a total fiction. The event of 1492 BC shows up assigned to the proper Katun (20-Tun-year period) in the Chilam Balam. Egypt's Middle Kingdom came to a sudden end, Indian civilization seemed to disappear, China's Shang dynasty stopped recording history for a hundred years and relocated its capital. Mesoamerica has the same complaint as the Bible of "walking in darkness" or under a heavy overcast for 40 years or for a generation. The occasion gave rise to the "myth of Typhon." A second, lesser, interaction happened 50 (not 52) years later, 1442 BC. The Sun stood still for Joshua. The periodic interactions with Venus had changed. The date of 747 BC (actually -747) is also originally from Velikovsky in 1950, and verified by such diverse sources as the start of the Babylonian Chronicle by Nabonassar on February 27, 747 BC. Known as the "Era of Nabonassar" this chronology was promoted by Ptolemy in about AD 150 as a means of record keeping for celestial events, and remained in use to about AD 1600. The Romans rationalized their calendar on February 28th. The Olmecs started the "Long Count" on February 28, 747 BC, and added 5 days to the 360-day Haab year (for the purpose of the Long Count, 360-day years continued to be used for the past). The number of nations who had a 360-day calendar in use before 747 BC is extensive. There were a total of nine "close calls" by Mars during this period, from 806 BC through 687 BC. This was first hinted at by Velikovsky, and asserted by Patten and Windsor (although I disagree with some of their dates and with their mechanics). It is also certified by Olmec records -- although in their strangely curious way of naming planets with a numeric prefix. Mars would have appeared inside Earth's orbit at 15-year intervals. A graphical ephemeris program -- a luxury tool not available to researchers in the 19th century and most of the 20th century -- will show that this could happen (but of course showing Mars outside the Earth's orbit). Mars would show up inside Earth's orbit if the orbital eccentricity changed -- which does not change a planet's period. An incident in 686 BC also produced an Earth shock. Velikovsky (and Patten and Windsor) had trouble attributing this event to Mars, and could not determine the correct date. An ephemeris program will show that it was caused by Mercury -- as verified by Plutarch in about AD 200. The date, in fact, can be obtained also from two Chinese records as March 23. The ephemeris, which even if it cannot be entirely correct for Mercury at this particular time, places Mercury in line with the Sun to within 1.1 degree in azimuth and 0.1 degrees in altitude on March 20. The year of 685 BC was found directly from the graphical ephemeris program by matching the description of The Sibylline Star Wars document of circa AD 150. Initially I had no clues other than the analysis made by Franz Xavier Kugler in 1927. To find the year I matched the Mesopotamian Venus Tablets of Ammizaduga, which describe the event, against the political activities of Assyria and Babylon during those years. Thus I closed in on 684 or 685 BC. This event is the "myth" of Phaethon, who, as Mercury (also mentioned by Hesiod), was struck by a thunderbolt coming from Jupiter, which actually was destined for the Sun. Travel of the plasmoid lightning bolt was seen and recorded worldwide. Specific dates were found from site alignments in Mesoamerica, and for the year 685 BC from the Chilam Balam. I looked at 13 Olmec and Valley of Mexico sites and found over 70 instances of six alignments which remained the same from site to site and determined the setting location of the Sun by date (plus the setting of the Pleiades). Sorting through these and comparing them to approximate dates and hints from other sources it quickly became obvious that these represented the event dates for 2349 BC, 1492 BC, and 747 BC. Although the year dates I have listed will in some instances be estimates, the seasonal dates are accurate. For the event of 685 BC the actual dates in the months of June and July can be found, based on a hint from the Quiche Popol Vuh. A breakthrough came from a closer look at time spans (four of them plus an equivalent Julian-year date!) listed in the Maya Chilam Balam. This information resulted in concrete seasonal dates: the date on which Venus and Mercury started to blaze in the skies in June, the date of the release of a 15-million-mile-long (24-million-km-long) lightning bolt (plasmoid) from Jupiter, and the date of its arrival at the Sun in July. These last three also allowed tracing the actual events recorded in The Sibylline Star Wars document. From an Australian Aboriginal myth we can determine the arrival time of the plasmoid to within two hours, and closer yet from Beowulf. The earliest portions of the Sumerian King List probably date from shortly after 2700 BC. Our copies were transcribed from earlier sources sometime after 2000 BC and did not come to light until after AD 1900. A conforming copy of the King List, however, was extant in Greece since about 280 BC, having been brought from Babylon to Greece and was quoted subsequently by Greek authors. The record was at that time already 2500 years old. The Sumerian King List has clear parallels in the Bible and in Egyptian records, and less so in Chinese and Vedic mythology, all of which are addressed in the section "Parallel Histories," below. In Assyrian times (after 800 BC), the calendar of 360 days uses a "sarus" to represent a decade (what we would call 10 years), where a "sarus" is identified as 3600 days. The fact that a "sarus" was still in use in Assyria in the 8th century BC, and meant 3600 days, not years, is good reason to suggest that the list of the "kings before the flood" is recorded in days, not years. The whole idea of even suggesting that the length of the year could have changed in the past, comes from the solidly established changes seen in the 8th century BC, when worldwide calendars of 360 days were superseded by calendars of 365 days plus one quarter day. Earlier changes in the calendar are noted from Egyptian sources (during the Hyksos period), and in Exodus, and this would suggest that the orbit of Earth had changed incrementally a number of times. Earlier yet we have the "mythological" records of Yao (in China) and Marduk (in Babylon) who both established the calendar after 2349 BC. The Chilam Balam makes the same claim. There is only a limited number of days-per-year which can be used to resolve the large whole numbers of the turn counts of the "kings before the flood." These have to represent orbits closer to the Sun than our present orbit of one AU. A 225-day year makes the counts come out even. This is almost exactly the present orbit of Venus -- at 0.72 AU. In Appendix B, "Celestial Mechanics," I will suggest that 0.72 AU is an average for an elliptical orbit of Earth with perihelion at 0.54 AU and aphelion at 0.9 AU. Lastly, let me again point out that I am using solar years -- revolutions of Earth around the Sun. Time spans in years of our current value of 365.24 days per year are of no interest, and inappropriate, since we are dealing with much shorter years. The solar year dates we are dealing with here will actually correspond closely to corrected radio-carbon dates, which are inadvertently adjusted to solar years with the calibration from tree-ring series (details further below). The record of the "kings before the flood" seems to reflect relocations in the strike point of the arc in the north Atlantic as the relocations of kingship to different cities. None of the five "cities" listed for the "kings before the flood" have ever been located. Each of the named "cities" looked from afar like a walled city, although in reality consisting of an immense dome of plasma (or water vapor) rising some thousand miles or more above the Earth. This is also identified as the "world mountain" as far away as China. Interestingly, the 225-day year counts (see the tabulation above) are multiples of 32 years, except the first ("Alorus in Heaven"), and the last (which is 2 1/2 multiples). There are other indications that "32" was of some importance. A count of 32 is still used today in finger counting in Pakistan, and represents two hands worth of knuckle counts. I will get back to this further below. In summary, what I have used from the list of "the kings before the flood" is, first of all, the total period when Saturn stood in the sky -- 1792 years, which spans the era from circa 4939 BC to 3147 BC (this includes the 700-year lifetime of Alorus). Secondly, I have used the start of the eight kings as the date when Saturn went nova, 3147 + 1072 = 4219. (Revised to 4077 BC below). Besides for some well-defined changes in climate worldwide, these are the only hints from remote antiquity that we have for these important dates. However, to this can be added the date of creation based on the death of Adam, as Saturn, in 3147 BC, and who, with a life span of 930 years, would have been born in 4077 BC (as calculated by Josephus). Since the eight kings show up in the mythology of other nations (in the case of the Bible with nearly identical proportional span of time), I am assuming that there is validity to the analysis performed here. I should note that in some instances the kings before the flood count as nine. This includes the number of kings given by Berossus, a listing in the Dynastic Chronicle of Babylonia. The name for Mars listed in the Chilam Balam, "Bolon Dzacab," means "nine appearances," but this may be a name for Mars after 806 BC. The list of "kings after the flood" is a composite of lists at various cities of Sumer, at times overlapping each other. It starts with the city of Kish, followed by Uruk (Erech). The first complete King List was (apparently) compiled during the Isin Dynasty (2017-1794 BC). Some 18 additional fragments and copies have been found at Nippur, Larsa, and other locations. Copies are at times divergent, but the sum of the reign lengths given at the end of each city always add up to the same number. An exception is the grand total for the first list -- the kings of Kish -- which exceeds any possible combination of reign lengths by some 6500 "years." More on this below. Literary analysis has shown that both the "kings before the flood" and the last part of the "kings after the flood" were added to other extant lists, and that the presumption of the passage of kingship from one city to another was retained despite a contemporary knowledge in antiquity of the overlap of dynasties. The reason for looking at the "kings after the flood" is to verify through yet another source that 3147 BC is a valid (or reasonable) terminal date for the "Era of the Gods" and a starting date for subsequent history. Thus if the sum total of reigns of the "kings after the flood" can be fit between 3147 BC and some archaeologically determined dates, then the King List could be trusted to represent 3147 BC as a valid starting point. The starting date of 3147 BC is from the "zero date" of the Mesoamerican Long Count calendar, but corrected as noted above. The Mesoamerican records reflect Tun years, which can readily be equated with solar years. How accurate the Mesoamerican records of the past is, can be gleaned from Book 10 of the Maya Chilam Balam books. This correctly dates every catastrophic event of the past to the correct Katun period -- except one -- thus establishing a correspondence to known or derived dates of the Eastern Mediterranean chronology. As a later date to check against the "kings after the flood," I will use Gilgamesh, the fifth king of Uruk, who is confidently dated to 2750 or 2700 BC, even if his actual existence is somewhat in doubt because his doings have been expanded to legendary heroics. It can be shown that the sequence of kings for the cities of Kish and Uruk, if correctly read, spans the time period of approximately 400 years from 3147 BC to 2750 BC. Similarly, this test can be done in reverse. If the date for Gilgamesh is held to be accurate, does the King List extend backwards from the time of Gilgamesh to reach 3147 BC as a starting point? As presented below, the sum of the individual reign lengths actually does not, missing 3147 BC by about 150 years. But there are clear reasons for that. However, the grand total for the first dynasty of Kish, which seems unrelated to the sum of the individual reign lengths, does reach back to 3147 BC. More on this further below. Another element I am looking to verify is the Egyptian claim that the lifetime of Horus was 300 years (from the Turin Papyrus and some temple records). If Horus (Mars) appeared at 30-year intervals for 300 years, then 10 visits would have been made between 3147 BC and 2850 BC (2770 BC if the 80 years of "negotiations" after 3147 BC are included). A number of things will strike you in looking at the King List. First, the length of reigns at the start of the lists (Kish and early Uruk) are again extravagant -- reigns of 300 to 1500 "years" -- but mixed in are somewhat shorter reigns. Immediately after Gilgamesh (fifth king of Uruk) the reign lengths become reasonable. The later Second Dynasty at Kish again shows a few extravagant numbers. Second, there is a lot of overlap, even though the lists in all instances read (to us) as if the dynasties at various cities follow each other chronologically. For the later dynasties, archaeological dating has both shown the existence of such overlap and sorted out much of it. An overlap is also true for the listings of the first two cities, Kish and Uruk. A summary follows below. The complete list of the "kings after the flood" has held up archaeologically, but the early portion is often thought to be "legendary" by archaeologists, like the list of "kings before the flood." But even for Kish, the 13th, 14th, and 23rd kings have been dated archaeologically. After Gilgamesh of Uruk it is easy to arrive at a second date of certainty, for example, the conquest after 2335 BC of all of Sumer by Sargon of Akkad. All five generations of the Akkadian kings are archaeologically dated with confidence. It is difficult to conceive that a collation of records from a dozen locations, dating back over a thousand years, was first attempted as late as 2000 BC. My sense is that the first attempt to extend the records from before 3147 BC was made in Uruk after 2700 BC -- after the "reign" of Gilgamesh. This early attempt to tabulate the historical records of the cities of Kish and Uruk had to account for 400 years. The record of the kings of the first city, Kish in Northern Mesopotamia, is the longest record of reigns of any of the cities, both in the raw information as presented to us, and in terms of "adjusted years" -- which I will detail below. Because of the extremely long reigns, the record for Kish becomes suspect of being a record of celestial beings -- in effect, the ten visits of Mars after 3147 BC -- conformed to actual kings who may have reigned at Kish, or the acceptance of a celestial God as the ruler. Below is a verbatim rendition of the King List for the city of Kish. (See the endnote for mss. sources.) I will follow with more detail and some notes. 1 In Kish, Jucur became king; he ruled for 1200 years. 2 Kullassina-bel ruled for 960 (ms. P2+L2 has instead: 900) years. 3 Nanjiclicma ruled for (ms. P2+L2 has:) 670 (?) years. 4 En-tarah-ana ruled for (ms. P2+L2 has:) 420 years, 3 months, and 3 1/2 days. 5 Babum ...... ruled for (ms. P2+L2 has:) 300 years. 6 Puannum ruled for 840 (ms. P2+L2 has instead: 240) years. 7 Kalibum ruled for 960 (ms. P2+L2 has instead: 900) years. 8 Kalumum ruled for 840 (mss. P3+BT14, Su1 have instead: 900) years. 10 Atab (mss. P2+L2, P3+BT14, P5 have instead: Aba) ruled for 600 years. 11 Macda, the son of Atab, ruled for 840 (ms. Su1 has instead: 720) years. 12 Arwium, the son of Macda, ruled for 720 years. 13 Etana, the shepherd, who ascended to heaven and consolidated all the foreign countries, became king; he ruled for 1500 (ms. P2+L2 has instead: 635) years. 14 Balih, the son of Etana, ruled for 400 (mss. P2+L2, Su1 have instead: 410) years. 15 En-me-nuna ruled for 660 (ms. P2+L2 has instead: 621) years. 16 Melem-Kish, the son of En-me-nuna, ruled for 900 years. (ms. P3+BT14 adds:) 1560 are the years of the dynasty of En-me-nuna. 17 Barsal-nuna, the son of En-me-nuna, (mss. P5, P3+BT14 have instead: Barsal-nuna) ruled for 1200 years. 18 Zamug, the son of Barsal-nuna, ruled for 140 years. 20 Ilku ruled for 900 years. 21 Iltasadum ruled for 1200 years. 22 En-men-barage-si, who made the land of Elam submit, became king; he ruled for 900 years. 23 Aga, the son of En-men-barage-si, ruled for 625 years. (ms. P3+BT14 adds:) 1525 are the years of the dynasty of En-men-barage-si. "23 kings; they ruled for 24510 years, 3 months, and 3 1/2 days." E-ana, where kingship is taken at the end of this dynasty, is the temple of An at (or near) Uruk. As you can read above, the 23 kings rule for 24,510 years, 3 months, and 3 1/2 days. This total would have been inscribed, in typical Sumerian accounting practice, on the back side of the tablet. But the reign lengths do not add up to 24,510 years. Something is wrong with the list, even though this version is a standard and a reliable translation. All the variant versions claim 24,510 as a grand total. As shown above, the total comes to 17,980 years. Some 6,500 years would have to be added to make up the difference, and this cannot be done by any stretch of the imagination. I will propose a number of causes for the discrepancy, and a solution. It has been suggested by others that the reigns for Kish do not add up because there are some numbers missing and there were copying errors. In fact, many of the tablets have some damage and also show divergent reign lengths. The reason the grand total remains the same is from the practice used with the accounting tablets since long before 2000 BC which show tallies and subtotals on one face and the grand total on the reverse. Thus the scribes who copied one tablet to another did so without ever checking if the numbers added up. It seems archaeologists also never checked. Kish: "Enmebaraggesi, the king who smote the Land of Elam." Uruk: "Meskiaggasher, the son of the Sun God, Utu (Shamash), ruled as both lord and king for 324 years during which time he entered the sea and climbed the mountains;"
Uruk: "Enmerkar, the son of Meskiaggasher, the king of Uruk who had founded Uruk." Uruk: "Dumuzi, the fisherman who came from the city of Kuara." and the note for Gilgamesh: "Gilgamesh, whose father was a spirit." The note about Meskiaggasher (2740 BC at Uruk), who "entered the sea and climbed the mountains," is interesting. This could be taken (as archaeologists have suggested), as the expansion of the trade of Sumer by Uruk at a location better served for contact via the Persian Gulf than northern Kish was -- ascending the Zagros mountains to reach the Iranian plateau, and entering the Gulf to reach Pakistan and the Arabian peninsula, as well as East Africa (all of which was actually done). But it can also be understood as Horus climbing his mountain, followed by a disappearance into the sea of the south skies, the Absu. Lastly, our Indo-European concepts of sequential time will have us completely misread the intentions of the scribes of early Sumer by making assumptions about relationships from the texts which were never intended. The obvious example is that the lists are assumed to be consecutive by us. This has proven to be completely false; the scribes had no such intention. When a list reads, "and then kingship transferred to so-and-so city," it could happen any time in the chronology of the so-and-so city. For example, at the end of the First Dynasty of Kish, kingship is transferred to Uruk, but it is after the time of the fifth king of Uruk, not at the time of the first king of Uruk. The later scribes of Sumer were aware of these discontinuities also, but the practice of assigning kingship to various cities on a rotating basis, which had started with Kish and Uruk, was continued as a "method" into the future. Even within the list for any city it would be our expectation to find the reigns closely consecutive, that is, without gaps of time where there is no king, and without periods where two kings might rule simultaneously. But this might not have been the case, and ought to be allowed for as a possibility. It has also been noted by others that some "reigns" might represent the length of life of a king rather than the years spent on the throne. These two "solutions" have already been adopted by archaeologists. But none of the caveats and conditions listed above properly explains the discrepant long reigns of Kish and Uruk, or the mismatched grand total for Kish. A misreading of ciphers has to be kept in mind, though, and a complete misreading of the first records of Kish by the scribes of Uruk comes closest to a rescue of the situation. This also applies to the early record of Uruk. Dividing all the listed reigns by 60 yields reasonable year lengths, reasonable, that is, for celestial phenomena. It brings the whole series to the time of Gilgamesh, although we still end up with spans of 15 to 20 years, which are generally too long as the reign lengths for normal human kings. Thus I suspect that the list of kings for Kish concerns itself with celestial beings, perhaps along with real people. More on this below. The summary below uses a starting date of 3067 BC. This is 80 years after the end of the "Era of the Gods" in 3147 BC, and represents the period of time that it took the Gods of Egypt to negotiate who among them would rule Egypt. The 80 years is mentioned in very late Egyptian sources. The rulership of Egypt was (after 80 years) assigned to Horus/Mars. I will suggest that the first kings of Mesopotamia and the first kings of Egypt were celestial beings, not humans. The orbit of Mars is too large for Mars to have been released from Saturn at the same location from the Sun that Earth and Venus were. We could assume that Mars remained entwined with Saturn until the asteroid belt was reached, some 50 to 60 million miles (80 to 100 million km) beyond Earth's orbit. Certain descriptive details in the records of Egypt, which are associated with the earliest records of Horus, would demand as much. We could assume that Mars did not come close to Earth until 3067 BC -- 80 years after 3147 BC. Note (1): coincidence of Kish 14 and Uruk 1. Note (3): coincident reign with Uruk's Lugabanda. Tom van Flandern suggests that a satellite which just follows along with another planet (without the need to orbit the parent planet), will quit this behavior when the parent planet nears another large mass, reducing the parent's "gravitational sphere of influence." I'm suggesting that the asteroid belt represented such an influence. Both Mars and Mercury were released as Saturn entered the asteroid belt. Mars (Horus) was involved in the 80 years of "negotiation" among the Gods before showing up (in Egypt) to claim rulership of the land. (The story dates from the 12th dynasty circa 1500 BC and is recorded circa 700 BC in the Chester Beatty Papyrus, now at Dublin.) In 3067 BC Mars must have gone into an elliptical orbit around the Sun with an aphelion near (or within) the asteroid belt, and a perihelion inside the orbit of Earth. Additionally it seems likely that Mars passed (infrequently) very close Earth. We do not know this exactly, but it can be surmised from the list of the kings of Kish, the first two pharaohic dynasties of Egypt, and even the current orbit of Mars, which still closes in on Earth every 30 years. It seems quite possible that the close approaches between Mars and Earth would only last for short periods of time -- days -- over a period of 300 years (so claim the Egyptians) and at 30-year intervals. The orbit of Mars might change with each near contact with Earth, although likely to be corrected with the next close pass. Earth, with 10 times the mass of Mars, would not be significantly affected. It is possible that the Sed festival of the Egyptian pharaohs was established on the basis of these infrequent incidents, when Mars would have formed a mountain form with the ionosphere of Earth -- what would have looked like a solid pyramidical form -- before the return and overpassings of Mars began to be measured differently. The advantage of starting in 3067 BC rather than 3147 BC is that the 300-year record of the kings of Kish now ends correctly at the time of Gilgamesh, who is dated at about 2700 or 2750 BC. Aga, the last king of Kish, is confronted by Gilgamesh, and is captured by Gilgamesh. The Sumerian legend Gilgamesh and Aga recounts this, although the information of the capture (and release) of Aga seems to have been appended as an afterthought. The main theme of Gilgamesh and Aga is how Gilgamesh stood up against the demands of the city of Kish, an event which forever changed the politics of Sumer. How important the primacy of Kish had been is shown by the titles taken by many later kings of other Sumerian and Akkadian cities, as "King of Kish and so-and-so." Ending a 300-year period at about 2750 BC makes a better fit also to the end of the Egyptian list of Horus pharaohs (the first two dynasties), and the start of pyramid building worldwide. Additionally, the 300-year period equals the life span of Horus, listed as 300 years in the Turin Papyrus, and other records. Other literary sources suggest that the Sed festival was celebrated at 30-year intervals (there is also at least one mention of 20 years). 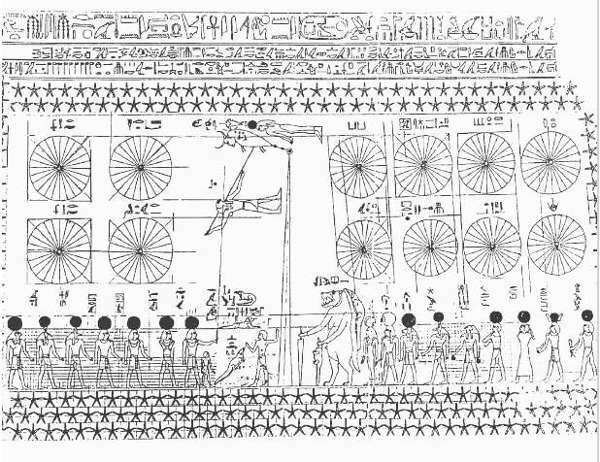 I think that the Sed festival might have celebrated the visitations of Horus, but it is also possible that the Sed festival dates from the time of the southern ball plasmoid and the overhead lines of electrons in the sky, and represents a symbolic survey of the land. But what is the meaning of the grand total of 24,510 years (408.5 real years) for the kings of Kish, when the total of the reigns add up to only 17,980 years (299.6 real years)? I think the "24,510 years" represents the interval between the date when the "flood swept over," which is the opening statement of the tally, and the date of the end of the listing of the kings of Kish. It thus represents a span of 408 years ending in about 2750 BC, but only during the last 300 years were there any kings assigned to Kish, ending circa 2768 BC. The scribes were correct; it was only we who had understood the "24,510 years" as the mathematical total of the individual reign lengths. The last line of the tablets, which reads "23 kings ruled for 24,510 years" should really read "23 kings ruled during 24,510 years" to conform to our notions of the passage of time. There is one more problem to be resolved. If at this point we were to look for celestial kings in the list of kings of Kish -- visits by Mars/Horus -- the first suggestion would be to assign them to the anomalously long reigns, of which five are on the order of 1200 and 1560 "years" in the original texts (equal to 20 "adjusted" years), and another 15 instances at 10 to 16 "adjusted" years. There are altogether some 20 of these "long" reigns. This differs from what has been assumed from later Egyptian sources, which claims ten visitations at 30-year intervals (although there are also some 17 to 19 pharaohs in the first two Egyptian dynasties between 3050 BC and 2700 BC). This particular solution also solves the problem that there is no mythology of Mercury at this early time. Obviously other combinations can be found. The above data is shown in the table below, along with another group of 11. What this grouping by two's does is to swallow the visits of one of the planets or the reign of one of the assigned kings. As shown above, there are not 10 visits at 30-year intervals as guessed from Egyptian sources, but 10 visits at various spans of time between 35 and 25 years apart. They average to 29.8 years, or to 30.4 if the last value of 25.4 is removed. I should again point out that the 30- or 20-year intervals do not represent the orbital period of either Mars or Mercury. These remain at around two years for Mars and probably the same for Mercury. Only at the long intervals listed above would they cross the Earth's orbit near the location of Earth. The planet God Saturn had ruled humanity for a thousand years. Then after 3147 BC came a period of uncertainty. But after 3067 BC Mars showed up again and was welcomed as the God and ruler. The repeated returns constituted the "kings" of Kish. The pharaohs of the first and second dynasty of Egypt form a parallel record. It is quite possible that we should not be looking for 30-year intervals, but for 32-year intervals. As I mentioned above, all the reigns of the "kings before the flood" are multiples of 32. In Western Europe there are a number of early megalithic grave sites with 32 or 34 distinct markers. The numbers 32 and 34 appear all too frequently as markers among the megalithic grave barrows to be mere coincidence. The only other countable elements of the megalithic chambers are the serpentine twinings used as decorations. But these make no sense. They appear in groups of 4, 6, 7, 8, 12, 13, 29, and 30. Some people would equate the groups of 29 and 30 with the orbit of the Moon. But there was no Moon. The later New Grange barrow does better. Of the 96 curb stones at the base, 32 are decorated -- incised with whorls -- the last, a very large decorated stone, lies in front of the entrance. New Grange was certainly built after 3147 BC, and thus may have been designed around possible 32-year inclusive intervals between visits by Mars after 3067 BC. If Mars actually showed up near Earth at regular 32-year inclusive intervals, then there might have been a need for the early chroniclers of the King List to make sure that the visits of Mars prior to the flood were also recorded in 32-year intervals. That, to me, seems the only resolution of the multiples of 32 years used for reign lengths of the "kings before the flood." That also reduces the confidence that the reign lengths are exact tallies of the time intervals. Mars/Horus fails to show up after circa 2750 BC. Perhaps some undetermined celestial event terminated the visits of Mars, although it is more likely that the second nodal points of the elliptical orbits of Earth and Mars had revolved away from each other. The midpoint of the career of Gilgamesh is estimated at 2700 BC, Carbon-14 dated from the reconstruction of the walls of Uruk, attributed to him in legend. Following Gilgamesh the reign lengths become reasonable, and it looks like actual solar years were used. In the tabulation below I have used actual years (as reported in the record) from Gilgamesh on. 1  Mec-ki-aj-gacir      324     5.4              (1)    2740 BC ? 2  Enmerkar             420     7                (2)    2750 BC ? Note (1): coincidence of Kish 14 and Uruk 1, dated 2720 or 2740 BC. Note (3): coincidence of Kish 17 and Uruk 3 (? ), father of Gilgamesh. Note (4): Dumuzid captures second to last king of Kish, 22.
last king of Kish, Aga. The end-years listed above are based on assuming the year 2700 BC represents the midpoint of the career of Gilgamesh. This has been Carbon-14 dated. Allowing 50 years before and after 2700 BC, Gilgamesh would have lived between 2750 and 2650 BC. The end-year for Aga of the city of Kish, 2768 BC, falls at the beginning of the interval which we can assign to Gilgamesh. I have kept Gilgamesh's reign at 126 years even though this is not at all justified. Gilgamesh is probably the planet Mars. Dividing by 60 reduces his reign to 2 years. The fact is, I suspect that Gilgamesh is both Mars and a human. From internal considerations, it would seem that the initial King List was probably first compiled after the time of Gilgamesh. A predecessor (Meskiaggasher, first king of Uruk) was listed as "the first to write on tablets" -- probably true for Southern Mesopotamia. It is to Meskiaggasher also that an expansion of trade was attributed. After Gilgamesh there is a sudden change in listing the reign lengths. Gilgamesh, located at the very end of the series of visits by Mars, becomes the Hercules of Sumer in the epics which follow. From the last king of the first dynasty of Uruk, archaeologically dated to about 2550 BC (and as 2547 to 2510 BC in the listing above), there is a clear archaeological path of dates leading to the Akkadian empire of 2335 BC, and onward to dates for the rule of Isin in 2207 BC. A record of eight lowerings of Mars before 3147 BC, that is, before the end of the "Era of the Gods," recognized as kings or godly rulers. A terminal date for the "Era of the Gods" when the polar configuration came apart. Details would include mention of the massive world flood of 3147 BC. A continuation of the chronology from this point in a record of the ten overflights of Mars after about 3067 BC and ending by about 2700 BC, and a transition at that time to a more solidly founded archaeological and chronological record. Lastly, and although not forthcoming from all sources, a record of the apparition which stood above the north horizon for perhaps a thousand years. This would involve changes in how this looked, going from a shrouded sphere to a fireball, the stream of plasma in arc mode, followed by a continued plasma stream in glow mode. Details would include Venus connected to Saturn with a swirl of plasma. Although the Maya disappear archaeologically before about 1500 BC, as do the Olmecs by 2000 BC, parallels are recorded in the books of the Chilam Balam of the 16th century AD. These were apparently copied from bark book codexes which are now lost to us. These records clearly date back to the end of the "Era of the Gods" and earlier. They were recopied to a European script by the Maya in the 16th century AD. The oldest historical records are found in Book 10 (and Book 11) of the Maya Chilam Balam. During the following period of Katun 9-Ahau (3087 to 3067 BC), "Ten-Sky" first appears, which are the close calls of Mars initiated after 3067 BC. Again, the repetitions are not noted. The name "Ten-Sky" is sufficient to indicate this. The same is done later for two series of repeating electric field interactions by Venus. Because only the Katun name is given, we do not know the actual date of the first appearance, only a 20-year range, but as guessed at above. Since all dates in the Chilam Balam books, except one (which was altered in antiquity), can be brought into concordance with estimated dates from Eastern Mediterranean sources, we can have considerable confidence in guessing the larger 400-year "Baktun" period, and the equivalent Gregorian dates. The editors of the Old Testament recopied old books, collated manuscripts, and reviewed the King List some 2400 years ago. As the oldest extant historical document, the King List could not be neglected, although as likely many Bible sources were Egyptian. The editors were also 1500 years closer to the Sumerian sources of 2000 BC than we are today, and not only took the information seriously, but most likely read the Sumerian texts correctly, for there is close agreement on the time spans between the Bible and the King List, -- not the "unmodified" long reign spans, but as modified by me above. There have been attempts by Bible scholars to justify the time spans in years of the Sumerian "kings before the flood" with the Bible account of the time span from creation to the flood of Noah, and especially to somehow account for the long lives of the patriarchs. In both texts eight kings or patriarchs are listed -- nine patriarchs if Adam is included. Note that according to the Bible Adam lived 930 years. We can assume that Saturn was understood as representing Adam, who "died" in 3147 BC. Subtracting Adam's life span from 3147 BC, brings us to 4077 BC -- close to my original estimate of 4100 BC as the date when Saturn went nova, and lit up like a sun -- the creation. Close, also, to Bishop Ussher's estimate of 4004 BC as the start of creation. There can also be little doubt that the Bible mistook the flood of Noah, 2349 BC, for the world flood of 3147 BC. Adding the span of 1680 derived from the Bible as the number of years between creation and "the flood" brings us to 2397 BC. The calculation is 3147 + 930 - 1680 = 2397 BC -- close enough to 2349 BC (my date). Ussher, using births and life spans from the Bible, calculates 1656 years. Josephus knew the span between creation and the flood as 1656 years, and might have subtracted 1656 from 3147 BC (my date for creation) to arrive at 1491 BC (as the "flood of Noah") but without identifying these years in our BC/AD calendar. Additionally, just as the list of the kings of Kish list 10 kings (although in groups of two) between the flood of 3147 and the time of Gilgamesh, and Egypt claims ten visits of Horus, so the Bible lists 10 patriarchs between the "flood of 2349 BC" and Abraham. Abraham is the 10th generation born after Noah (I am counting Shem, son of Noah, actually born before the flood). All except the first and last of these 10 generations were sired when their father was 29, 30, 32, or 35 years old. After Abraham, as with Gilgamesh, the life spans become normal. I do think that the Bible may have used the King List as a source. But what we are seeing is a record in parallel to the Sumerian sources, or Egyptian sources (since by tradition Moses was the original author of Genesis). What I think we are seeing, as I have expressed earlier, are complete fictions, based on slim recollections, other peoples' stories, and a need for narrative continuity. Abraham, if equated to Jupiter, would have a first appearance as a giant figure in the sky two and a half days after the fall of the Absu (on the calendar date of September 6) in 2349 BC. If he then lives until 2150 BC (a most likely date for his demise) he would have lived 199 years. The year 2150 BC is what I had earlier selected as the year that Jupiter blazed in flames and disappeared from view (died) to be seen afterwards only as a star. The Bible, however, claims Abraham lived 175 years, and also places his whole life at a completely different time period. The difference between 199 years and 175 years is considerable. We should accept either the year of Abraham's first appearance (2349 BC) or the year of his end (2150 BC) as certain. It is possible that 2150 BC is not as hard and fast as I may have suggested. However, the Maya Chilam Balam comes to the same conclusion for the burning of Jupiter, placing it in a Katun which includes 2150 BC. The demise of Jupiter happened in a Katun 8-Ahau (2.10.0.0.0) which is a 20-year period nominally ending in 2128 BC, but should be corrected to 2167 - 2147 BC. This includes 2150 BC. The other correction by 25 years would be to suggest a "birth" for Abraham in 2325 BC, some 25 years after the "flood of Noah." The only celestial event that can be tagged to this date, or some date close to it, would be the regularization of the Moon. I have previously suggested that I cannot with any certainty place the year when the Moon started to orbit Earth, except to say that it probably was shortly after 2349 BC, after the Earth had moved to a larger orbit. A best suggestion for a date comes from the Chinese Annals of Shu, which assigns the birth of Shun (the Moon) to 2318 BC. The dates derived from the Annals of Shu may not be entirely correct, but the date is closer to 2325 BC. So, now what? I would suggest that the "birth of the Moon" was mistaken or misread for the birth of Abraham. There is some elegance to this solution: this disconnects Abraham from the "flood" and it disconnects him from being a God who appears fully formed in the sky suddenly. It is obvious that the 6th century BC Bible editors confused the flood of 2349 BC with the flood of 3147 BC (as many people did), and had to place the birth of Abraham (additionally) 400 years later to have his life follow the offspring of Noah. Typical of the Bible, as with many other sources of antiquity, is that spans of time are often accurate, even when there seldom are any starting or terminal dates. So the 175 years for the lifespan of Abraham remains as correct, even if the dates of his birth and death are altogether uncertain. Egyptian parallels can be found from three sources for the kings of the first and second dynasties: (1) the Palermo stone list of kings (about 2550 BC), (2) the Turin Papyrus list of kings (circa 1200 BC, or more likely 950 BC), and (3) the written records of kings left by Manetho (about 300 to 200 BC). These last, although spanning 2200 years, are congruent for all practical purposes, and mostly validate each other. I will discuss the predynastic archaeological record separately further below. The pharaohs from the First through the Second Dynasty use "Horus names." There is one exception in the middle of this list, a pharaoh who takes a "Seth name." After this one use, no pharaoh ever takes a Seth name again (excepting once more in the 19th Dynasty after 1300 BC). The second dynasty ends in 2705. It is the first and second dynasty which ought to be compared to the list of "kings after the flood" and the Bible patriarchs. The dynasty groupings may have been selected by Manetho, perhaps arbitrarily, although these could represent family groups, or represent blocks of a unified political or religious climate. It has also been suggested that some dynasties may have been grouped by the location (city) which held political power for a length of time. Thus the separation of the early kings in Egypt into the first, second, and third dynasty may not mean anything. The graves of the Horus pharaohs at Abydos (Central to Upper Egypt) are apparently cenotaphs, with the alternate (real) burials at Saqqara (or, as currently understood, the reverse of this). Abydos is also the city of Osiris, and his "grave" had become a site of pilgrimages in late antiquity. If then the graves at Abydos start with the grave of Osiris, followed by a dozen graves of Horus, it might be suggested that the Egyptians pro forma provided graves for the deity which the pharaoh represented. The alternate (and accepted) explanation is that the cenotaphs were politically significant -- in representing separate graves as "King of Lower Egypt" and as "King of Upper Egypt," although this is a modern political interpretation. There were no separate kings of Upper and Lower egypt. It is all too obvious that we should seek explanations in ancient religious motivations, not in modern political philosophy. There are, as there are in Mesopotamia, some 20 pharaohs, but possibly 17. The reign lengths for most are far too long as earthly kings, and the series also does not follow the obvious progression of a series of 30-year intervals. The reign lengths of the first and second dynasty pharaohs depend mostly on archaeological findings and archaeological dating, and are not as concrete as the Mesopotamian written record. The Turin papyrus gives dates which are much too long, and the Palermo stone is very incomplete. There are ten "Legendary Emperors of China" as listed by Joseph Campbell, but only eight in number from Taoist sources, a set of three nobles, followed by a set of five "Tis" (Tîs) -- a word clearly meaning "Gods" but usually translated as "Emperors." Considering that the dates assigned to these eight or ten "Legendary Emperors" falls after 3147 BC, at first glance it looks similar to the Mesopotamian list of the "kings after the flood." Fu Shi, wrote Campbell, is equated with Adam. Even so, following him, Shen Nung, who must represent the egg in the sky, lived 17 generations (from some sources), thus about 820 years, not far from my estimate of 720 solar years. However, all the listed dates are in complete disorder. It is more likely that the three nobles represent the three ball plasmoids in the south, and the three periods in the remote past that these were seen. Period of the three nobles "San-huang"
Period of the 5 emperors "Wû Tî"
1 Huang Ti             100 years       2698-2598 BC "Yellow Emperor"
"Prior to the dynasty of Hsiâ [Xia], with the exception of the period of Yao and Shun, the accounts which we have of the history of China have been, and ought to be, pronounced "fabulous" and "legendary." The oldest documents that purport to be historical are the books in the Shu; about Yao and Shun, and even they do not profess to be contemporaneous with those personages." -- James Legge, introduction to The Sacred Books of the East, The Shu King (volume 3) (1879). Huang Ti, the "Yellow Emperor," has long been identified as Saturn. The lifetime of Huang Ti is only listed as 100 years, even though he brought all the gifts of civilization to China. Other information lists his reign as 300 years (Confucius). "He consulted with his sages while deliberating on the "Bright Terrace;" ... he assembled the spirits on the holy mount T'ai-shan." "In the fourth Book of the Li Kî is called Yüeh Ling, 'the Monthly Record of the Proceedings of Government.' In it certain sacrificial observances paid to the five Tîs are distributed through the four seasons. The Tîs are Fû-hsî, Shan-nang, Yû-hsiung or Hsien-y&�uml;an, Kin-thien, and Kâo-yang, who are styled the Greatly Resplendent, the Blazing, the Yellow, the Less Resplendent, and the Solely Correct." Fû-hsî -- "the Greatly Resplendent" -- Saturn as a globe (the egg) standing above the North Pole after circa 9000 BC, and clearly seen since perhaps 5800 BC. 115 years, but elsewhere listed as "17 generations." Shan-nang -- "the Blazing" -- Saturn after going nova in 4077 BC. 120 years. Hsien-yüan -- "the Yellow" -- Saturn still in arc mode discharge, or reduced to glow mode level. This is Huang Ti in the list above. 100 years. Kin-thien --"the Less Resplendent" -- Saturn in a late, less active mode, perhaps completely reduced to glow mode plasma discharge. 78 years. Kâo-yang -- "the Solely Correct" -- I suspect this to be Jupiter as the Midnight Sun after 3147 BC through perhaps 2300 BC. 70 years. However, see below. The total time span of the first four Saturn manifestations is only 413 years. This certainly falls far short of my estimate based on the Sumerian King List. But it is close to the time span between 3147 BC and the last visit by Mars/Horus (the transfer of power from Kish to Uruk). The assigned dates (years) may thus have come from a much later period. "The earlier accounts open with a Phan-kû, in whose time 'heaven and earth were first separated.' To him succeeded the period of the San Hwang, or Three August Lines, consisting of twelve Celestial, eleven Terrestrial, and nine Human Sovereigns, who ruled together about 50,000 years. After them come a host of different Lines, till we arrive at the Wû Tî, or Five Emperors." The date for when "heaven and earth were first separated" is likely the end of the manifestations of the southern ball plasmoids in 8347 BC or could be the end of the "Era of the Gods," 3147 BC, but it certainly is not followed by a 50,000-year period of rulers. It may also represent a failure of one of the periods of the southern ball plasmoids. Egyptian "mythological history" interestingly includes the same excessive time span for a large number of unnamed rulers, the "Followers of Horus." In both cases these may be asteroids on a path crossing Earth's orbit, what today would be called a meteor swarm. The 50,000-year period is likely the sum total of all their simultaneous appearances, or may represent the fact that these objects in the sky (which I will assume them to be) had appeared since ages immemorial. Hsî [Xia] lasted for 439 years, from B.C. 2205 to 1767. Shang or Yin endured for 644 years, from B.C. 1766 to 1123. The Kâ [Chou] continued for 867 years, from B.C. 1122 to 256.
founding of Khin [Chin] dynasty in B.C. 221. Legge, on the other hand, suggests a minimum of 500 years for each of the dynasties, based on Mencius (a follower of Confucius), as the Taoists writers might initially also have used. Either calculation places Yao in circa 2300 BC, or at the time of the "flood of Noah" of 2349 BC, and has Shun end his activities shortly before the worldwide climatic downturn of 2193 BC. Yao is Jupiter; Shun is the Moon. That much is certain. The similarity to the list of the "kings after the flood" ends here. The complete time span of the three Dukes and five Emperors, from the accession of Fu Shi in 2953 BC (already one hundred years late) to the accession of Yü in 2205 BC, amounts to 748 years. This is much too long to represent the comings and goings of Mars/Horus between 3000 and 2700 BC. The celestial nature of these "Legendary Emperors" is assured, however, in the information supplied for them. "Fu Xi is represented as a human being with the body of a snake." This is most likely the southern plasmoid and its electron beam extensions in the era after 10,900 BC. "San-huang is sometimes portrayed with the head of an ox." This recalls the celestial bull of Sumerian sources, and ought to be equated with Jupiter. "Huang-di is credited with the creation of mankind; a dragon descended from heaven and carried him aloft." "After the death of Yao, Shun seated himself on the throne. Ten suns appeared in the sky, threatening to scorch the earth to a cinder. The heavenly archer Shen Yi managed to shoot nine out of the sky with his magic bow." This will be recognized as the plasmoids delivered in 2349 BC by Venus. The Tîs bestow the gifts of civilization to mankind -- the ordering of tribes, giving of family names, agriculture, irrigation, fishing nets, music, medicine, writing, pottery, silk worm breeding, and, amazingly, the creation of mankind itself. This is the same set of gifts received from the Gods in Mesopotamia during the "Era of the Gods." What I think we are looking at is a recollection from the "Era of the Gods," not the celestial kings (or Gods) after 3147 BC. The period of the "Legendary Emperors" (and the three Dukes) is 748 years. My estimates from the Sumerian King List is that the "Era of the Gods" lasted 1072 years. I have no problem with the differences in these time spans, since it seems obvious that the Chinese records where displaced by a thousand years to mark the beginning of creation. This involves not only a confusion of the descents of Mars during the "Era of the Gods" with the similar visits by Mars during the period after 3147 BC, but, as many people had done, a confusion of the flood of 3147 BC and the flood of 2349 BC. In effect the record, which originally ended in the flood of 3147 BC, was moved to an era also ending in a flood -- the "Noachian flood" of 2349 BC. In the Chinese Annals of Shu, after 2349 BC, Yao sends his astronomers to the four borders of China to observe the stars and determine the calendar. But, as Chinese scholars have noted, Yao already knew the answers, and states them. He also proclaims that "a round year consists of three hundred, sixty, and six days" and that the year and the seasons are to be completed by the use of an "the intercalary month." It is fairly certain that the Shu existed already in 700 BC. The chapter, however, which tells of Yao's calendar efforts, is noted, in its introduction, as a document not contemporaneous with the events that it recorded. In fact, the text about a year of 366 days and the intercalary month proves that the documents were amended or corrected after 747 BC when the year changed to a value close to 366 days and an intercalary month would be needed to bring the months in tune with the length of the year. It certainly was not contemporaneous with Yao, when the year would have been 260 days long. The only thing I would feel confident about is that a calendar revision was made circa 2350 BC. The first Chinese historical records were written after circa 2200 BC (the first contemporaneous statement of the Shu is in 2197 BC by the son of Yu), but woven in are a confused recollection of a series of earlier Gods. Yao and Shun can be identified with some certainty. Yao is Jupiter as the Midnight Sun, the later Re of the Egyptians. He appears before the "flood of 2350 BC" (which is mentioned twice in the Annals of Shu), and which matches my assumption that Jupiter developed a coma after exiting from the asteroid belt, perhaps at about the time of the 5th Egyptian dynasty (2550 to 2500 BC) when the Egyptian pharaohs add "Re" to their names. But the coma disappeared before 2349 BC. The recreated chronology by Chinese scholars in about 200 BC holds that Yao died in 2257 BC, 30 years after having shared his throne with his follower, Shun. Shun first shows (is born) in about 2310 BC. Shun is the Moon, which by my estimate first showed perhaps at the time of the fall of the Absu, which the Annals of Shu describe as waters "standing up to the heavens." The Annals of Shu also records activities for Shun, each one of which takes exactly a month, and which frequently start on the first day of the month. Shun spends a great deal of time traveling on inspection trips. We could not be told more plainly who Shun is. Both Yao and Shun are referred to as "Tis," that is, "Gods." The next ruler is Yu, a human selected by Shun. Yu is listed as a "king" (a potentate over an Earthly region) and not as an "emperor" (the sovereign over all of the world). An "emperor" does not again appear in China until 2000 years later. Hindu sources are overwhelmingly vast, encompassing thousands on thousands of pages of poetry, often in competing and contradictory tracts. Additionally, all the doings of the earlier Gods have been heavily anthropomorphized, so that much of the texts read as if events actually happened in recent antiquity and took place in the lands of India. In the poem Mahabharata the Bharata battle is essentially the War of the Gods, as I have noted elsewhere, and is by some dated as starting in 3037 BC. Others, for example S.B. Roy and K.C. Varma in Mahabharata and Astronomy, a chapter of "Mahabharata, Myth and Reality" (1976), attempt to place the Bharata battle by calculating when the Pleiades would have stood at the horizon at the equinox heliacally with the Sun. They arrive at a date of circa 1432 BC by calculating backwards. This suggested date has led to extensive attempts to validate the battle through archaeological finds, with no results. "The most important feature of the cult of Vis.n.u is the belief that he periodically causes himself to be born as a being in the world. He does this out of compassion, and this is probably responsible for his epithet as the 'Preserver.'" "In the cycle of time within which we live, called a Mahâyuga (either 12 thousand or 4.3 million years), there are supposed to be ten Incarnations (or Avatars) of Vis.n.u. Nine have come already: (1) as the Fish, (2) the Tortoise, (3) the Boar, (4) the Man-Lion, (5) the Dwarf, (6) Parashurâma, (7) Rama (of the Ramayana), (8) Kr.s.n.a (Krishna, of the Mahabharata), and (9) the Buddha." "As the Buddha, however, Vis.n.u is supposed to have taught a deliberately false doctrine (which is how Hinduism always sees Buddhism), to destroy demons. The tenth Avatar, Kalkin, will usher in the end of the world (or the end of the Mahayuga)." Neglecting the long time spans (which Hindu texts are especially given to, often to correct for lapsed predictions of periods from older sources), you will note again the eight appearances of Vishnu, with Buddha added at a much later date, and the promise of a tenth appearance. This looks like a conflation (as with many other people) of the eight visits of Mars before 3147 BC, and the ten visits afterwards. Included in the appearances are the very early "fish" and "tortoise," likely dating to the era of the southern plasmoids. The following table is a summary restatement of the days in the year during various periods, and the estimates of the days in a month (a lunar orbital rotation), if there was a Moon. The text will explain how calendars varied over the ages, and how different people made adjustments to old calendars to meet new conditions. This information brings together data distributed over the texts of previous chapters and endnotes and adds some additional information. Hopefully, you will be able to make sense of the many calendars in use throughout the world, and why these changed. The radius of the Earth's orbit has varied over time since 3147 BC. Additionally, the orbit was certainly more eccentric at earlier times (which does not change the orbital period). During most eras (except the last two) the orbit of Earth probably swung out to as much as 0.9 AU at aphelion. At perihelion Earth would have had to travel to well within one half AU in order to have the short average solar years listed below. Thus the "days per year" shown below cannot be translated exactly into an equivalent distance from the Sun based on a nearly circular orbit, as we have today. It would only be an average. The "Kingdoms" refer to well-known Egyptian eras. 10900 - 8347 BC, the "first creation"
In the thousands of years before 3147 BC the Earth's orbit was determined by the path which Saturn took around the Sun. But apparently the Sumerians kept a count of days during this period. It is doubtful if either they or anyone else kept a calendar, or even felt the need to. The Sumerians (or their predecessors in Northern Mesopotamia) had been keeping accounts of agricultural products since 8000 BC, and would have been perfectly capable of a tabulation of this sort, even though it ran to a numerical value of 162,000 -- a numerical value held by some as representing years, judged to be nonsense by archaeologists, but thought by me to represent days. The Olmecs were counting years since long before 10,900 BC, but called the event of the shadow of 10,900 the "first creation." They counted in years called Tuns, double decades called Katuns, and sets of 400 years, called Baktuns by us and "400" by them. An isolated page of the Chilam Balam mentions conditions before 10,900 BC, possibly reaching back to 17,000 years ago, equivalent to the European Magdalenian period, and earlier to perhaps 41,000 BC. But of course nothing is identified by years, but only as very long periods of time. If, as I suspect, Earth was carried away by Saturn a number of times in the last 40,000 years (as Tom Van Flandern's gravitational theory allows), then Earth would have experienced a series of variable years, with aphelion far from the Sun, and infrequent plasma stream contact with Saturn. This would explain the apparent long years before about 10,900 BC (see the Carbon-14 section further below), and the inexplicable series of glaciations. 8347 - 3147 BC, the "second creation"
A 225-day year is obvious from the "kings before the flood." It is the only close orbit that fits the data. It would have been in effect from 8347 BC to 3147 BC, and during all of the "Era of the Gods" (4077 BC to 3147 BC). The equivalent orbital distance from the Sun would have averaged 67.5 million miles (108.7 million km, 0.72 AU), but likely Earth was still traveling much further away as part of its elliptical orbit. The Sumerian record was most likely recorded in days. Again, except for this record we have no data on any sort of calendar system in use anywhere, although the Egyptians have a record of the "lifetimes of the Gods" in years (but these, as also in China, often run simultaneously). The Maya Chilam Balam books record the interactions of planets for this period, and even speak to the electric eruptions of Saturn (as does the Popol Vuh), but provide no tallies of year counts before 3147 BC. The 240-day year was originally found by inspecting of the data of the "kings after the flood," but it can also be inferred from the remnants of calendars in use in the following era (as in China which divides the year up into four 60-day periods). The 240-day year would have been in effect from 3147 BC through 2349 BC. The equivalent orbital distance from the Sun would have averaged 70.3 million miles (113 million km, 0.75 AU). This period starts with the massive flood from the South Pole. This was the most monumentally disruptive event in history. All the previous celestial displays had been well away from Earth, and could be neglected. The flood changed that. Here was a separation between "before" and "after," and it is little wonder that many people now show a concern with the passage of time, and start tallies of days and years. Within fifty years the Egyptians start an annual record of Gods or God-pharaohs. The calendar is annual, and years are named after religious festivals or other accomplishments. The years are without notation of seasons or months (there was no Moon yet). The city of Kish in Mesopotamia similarly keeps track of Gods or God-kings by "years" (or some indeterminate measure of time). In only one instance a "month" is indicated in the record, but it seems to be an error, or may have been meant to signify a fraction of a year and was added at a much later date. The predecessors of the Maya were counting in Tuns ("stones"), which are years, and in Katuns, which are twenty-year periods, and in a larger measure of 400 Tuns, known (to us) as a Baktun. Certainly a record of years was kept, likely in terms of the larger blocks of 20 years and 400 years, for in the 16th century AD the Maya Chilam Balam will be able to correctly specify the Katun of almost all of the celestial events since 3147 BC which we know from the Eastern Mediterranean. The Classical Maya sculptures at Palenque (circa AD 700) correctly date planetary incidents in the past -- 3000 years earlier -- from a record which must have been known as familiar history to the sponsor of the sculpture as well as the leaders of neighboring ceremonial centers. Similarly, when the Olmecs instituted the Long Count in 747 BC, they were aware that six Baktuns (2400 solar years) had already lapsed since the beginning of the current creation. See the chapter "The Maya Calendar," for more details. The Olmecs, Maya, and their predecessors, kept a running calendar longer than any other people on Earth. Despite the Egyptian records of regal years dating from shortly after circa 3050 BC, we are not sure today how closely the "years" of the pharaohs matched actual solar years, since the count of years was restarted with the accession of each pharaoh, and it is not clear when a new pharaoh was invested after the death of the previous one. Later Chinese kings (in the next era) similarly did not count the first three years of a reign, at the start of accession, until later in history. The calendar of the Mesoamerican people was divorced from the personalities of leaders, had a solid base-5 and base-20 counting system, and was built around a modern conception of what an "interval" constituted, unlike the Sumerians whose early chronologies do not add up (and overlap) or even the much later Romans who still counted the passage of time as if it were a set of objects. The initial Mesoamerican calendar divided the year into 12 seasons of 20 days. This may have constituted an agricultural calendar, allowing 20 days for seeding, weeding (a number of times), the breaking of corn stalks, and the eventual reaping. Each of the 20 days received a name, which continued in use for the next 5000 years. This is almost certain, because there is no logical transition to the Tzolkin calendar after 2349 BC except to suggest the very early establishment of the rotation of 20 named days. From China we get a clearer indication of an archaic calendar system, but of course as remnants retained at later ages. China seems to have had a calendar based on dividing the 240-day year into four seasons of 60 days each. China, unlike Mesoamerica, Egypt, and Mesopotamia, had distinct seasons. This division of the year into 60-day periods remained a standard for 5000 years. Both the four seasons and the 60-day periods remained in use. Even after the Moon arrived in 2349 BC, the months were associated with the 60-day seasonal divisions. This period starts with the "flood of Noah," and the first appearance of the Moon. The Moon stabilized within an estimated period (by me) of 35 years. It is at this time that we see the first indications of calendars in widely separated regions of the world. The Earth is now 74 million miles (119 million km) from the Sun (0.797 AU), and the year had extended to 260 days. The regular appearance of the Moon became the calendar, signaling to everyone the days for religious festivities. There were, during this first period after the fall of the Absu, ten months of 26 days each. At the end of ten months, the year and the cycle of religious observances started over. The 260-day year is an acknowledged number which shows up in Mesoamerican sources as the Tzolkin calendar. The Chilam Balam makes specific mention of the addition of "days of the year" at this time. The earlier Mesoamerican calendar of 20 days was at this time augmented with the addition of a simultaneous rotation through 13 days, started in this period. This is the Olmec and Maya Tzolkin calendar. The rotation through 13 numbers represented the period from a new moon to a full moon, and from full moon to a new moon. A complete rotation through 20 and 13 also distinctly named and numbered each day of the 260-day year. The Mesoamerican Tzolkin calendar is still in use today in parts of Guatemala, the Yucatan, and Southern Mexico. In China one of the last of the mythological emperors (Gods), and the first to enter recorded history, Yao (who is Jupiter), instituted the calendar which was used by the Xia and Shang dynasties. So says the historical record, the Annals of Shu. But the Annals, gathered together in the 8th century BC, speak of Yao establishing a 366-day year. This emendation to the historical record was thus made after 747 BC, but before 685 BC, since Yao also tells his astronomers that the Pleiades mark the equinox. After 685 BC, this last was no longer true. The new Chinese calendar continued the 60-day periods, but added the day of the lunar month to specify actual dates. In the Babylonian creation epic, the Enuma Elish, the God Marduk (Jupiter) also establishes the calendar after the demise of the Absu. A second change in the Earth's orbit happened in 2193 BC, when the Akkadian empire failed and the Old Kingdom of Egypt came to a close. Worldwide there was a lack of rain, or a lack of light, lasting years. Mesopotamia and Egypt (and other locations) took up to 200 years to recover. The Earth was now 77 million miles (124 million km) from the Sun (0.83 AU). The year went to 270 or 280 days (probably 273 days). I suspect that the number of months in the year stayed at 10, each approximately 27 or 28 days long. Mesoamerican culture accommodated this easily by extending their 20 by 13 Tzolkin calendar by another cycle of 13 days, and just ignoring the fact that their annual calendar was now 13 days short. Other people apparently adopted 10 months of 27 and 28 days to fill the year. Mesoamerica divides the visible south sky into "13 zodiac divisions" of 21 days each (totaling 273 days). The 13 divisions will remain and will surface again in Classical Maya times (as the Paris Codex shows), but the periods of each of the 13 constellations will lengthen to 28 days by the time we reach our era, adding up to 364 days. During the Shang dynasty (1700 to 1100 BC) there are oracle bone records which record a 27- and 28-day lunar period. The Shang (apparently) also maintained a calendar based on multiples of 60 and 10. It seems to be a holdover from a previous era, when there were 240 days in the year, but not 10 months yet. The Chinese also established "28 lunar mansions" across the dome of the stars to track the Moon. It may be an amazing coincidence (although it should not be) that the Vedic Indians (who had no contact with China during this period) do the same. The Indian notion of "28 lunar mansions" has lasted in Indian astrology to today. After 1492 BC the Earth's orbit increases significantly, to 0.99 AU. The 360-day year is a clear certainty from many records, and in effect up to 747 BC. The equivalent orbital distance from the Sun would have averaged 92.1 million miles (148.3 million km). There were 12 months of 30 days. The 360-day year is so well established from so many documents, that some researchers today just take it for granted, although students of antiquity have to apologetically add, "plus the five days," or make excuses for the people of this era with statements like, "they used an idealized year" or "they could not count." What an amazing statement! Counting would have been the highest science of the human intellect since the Paleolithic. Babylonians establish 18 divisions of the ecliptic, of 20 degrees each, thus also 360 degrees -- or 360 days. The passage of every three divisions of 20 degrees (days) represented two months of 30 days. The 360 degrees of circular measure that we use is based on a long period of time when there were 360 days for a complete circuit of the Sun. China apparently also divided the ecliptic into 360 degrees. These divisions of the sky reflect the fact that the year was 360 days, not 365.25 days. China changed its division of the sky to "365.25 degrees" some time after 747 BC, when the year became longer, and kept this in effect until about AD 1500. "During the Shang Dynasty [1700 to 1125 BC], the Chinese had in place interlocking cycles of 10 days and 12 days; together, these made a cycle of 60 days. This 60-day cycle was kept, apparently continuously, for thousands of years. Astronomical events recorded by the Shang Dynasty people were noted by the place in the 60-day cycle, as well as the lunar month and reign year. With this information on several lunar eclipses, there have been attempts to correlate the Shang calendar with our Christian calendar, but these attempts have not been successful." The Shang calendar records, mentioned above, date to after 1500 BC. The 60-day periods cannot be squared against the day count and month count of the previous period (the 273-day year), but it elegantly suited the configuration of the heavens which took effect after 1492 BC. It is likely that the Shang "60-day period" at that time reflected a double lunar month period, similar to the Babylonian division of the year. It is also likely that this represents a month-like division of the synodic period of Venus. We cannot neglect Venus as a "marker" for calendar use, especially when it is noticed that many nations adopt an awkward "Venus calendar" as a means of resolving the new length of the month and the new length of the year after 747 BC. Venus would represent a stupendous sight at its heliacal rising or setting. Unlike any other planet or star, which all but disappears in the glare of the Sun or the haze of the horizon at heliacal rising or setting, Venus, at its heliacal rising (and in reverse order at the heliacal setting), would show the tail of its coma initially directed toward Earth, and thus as a bright light, and then, as soon as it cleared the Sun, the tail would expand to sweep straight up into the sky over the next few days. The "going up of Sothis," as described by Egyptian records, is not simply the appearance of Venus, but describes the spectacular levitation of its tail. It is a marker much easier to determine and much more visible than the equinox of the Sun or the periods of the Moon. During the period of 1492 to 747 BC, the synodic period of Venus would have been exactly 600 days. The rising and setting of Venus would only fall back into sync every eight Earth years (225*5 - 360*8 = 0). Six hundred days is ten 60-day periods (equal to twenty lunar months). But it is unlikely that the start of, for example, the heliacal rising of Venus would have coincided with the lunar month. For this reason the Shang continued to keep track of the 60-day periods and months separately. Calendars are very conservative, and they are not easily changed. Thus, although the number of months in the year during this era expand from 10 to 12, numerous people throughout the world steadfastly maintain a year of ten months into the 20th century AD (3500 years! ), making adjustments to the solar year by, for example, expanding the last month to 90 days or repeating it twice. Saner people adopted the lunar month as the calendar, although in some instances at the value of the previous era, 28 days. This then became a "calendar month," resulting in the need to intercalate additional months periodically if the calendar was to keep in sync with the apparent lunar months. The Babylonians elected, additionally, to start the year with the spring equinox of the Sun. I would suggest, in fact, that this coincided with a new Moon. (This was suggested by Velikovsky and seems correct for a number of reasons.) The new Moon might be a lot easier to spot than the rising of the Sun at the equinox. The predecessors of the Romans, however, not only maintained the 10-month calendar, but probably rotated through the ten months twice to match the synodic period of Venus. The month count was not rectified until sometime in the era after 747 BC. Roman historians relate that one of the first kings of Rome shortly after its founding (before 747 BC) added two months to the calendar of 10 months. This would only have been needed if the Romans, as I have proposed above, still rotated through sets of 10 months. If the historians recall the addition of two months to the ten, it would confirm the fact that prior to that time the earlier ten-month calendar was still in use. The two added months, January and February, were added after the last month of the year, December ("Ten") and, like all the other months, were set at 30 days. This must have happened before the length of the year changed again in 747 BC. After 747 the Earth assumed today's orbit of 93.2 million miles (150 million km, 1.0 AU), and a year of 365.24 days. The Moon changed its period to 29-1/2 days. There were now slightly more than 12-1/3 lunar months in the year. This would cause no end of problems, for the lunar months no longer coincided comfortably with religious feast days in the solar year. In other endnotes I have shown how the extra days of the year were elegantly distributed to the months of the year by the Romans. Also, in the chapter "The Maya Calendar" I have detailed the start of the Long Count of the Olmecs. The jolt by Mercury in 686 BC made no significant change to the year of Earth, but may have reduced the Moon's period to its present value. "Hermes ... playing at draughts with the moon, won from her the seventieth part of each of her periods of illumination, and from all the winnings he composed five days, and intercalated them as an addition to the 360 days". "In that celestial crap shoot, the Moon lost 1/70th of her holdings, or its period, while the winner, the Earth gained a similar 1/70th of its day count per orbit, an addition to its former orbit period." "The Moon's modern period is 29.53 days. 30 days minus one part in 70 is 29.57. Plutarch was within .04 day of being exactly correct for the new lunar period." "The Earth's new period, 365.256 days, less one part in 70, results in an earlier period of 360.038 days. Here again Plutarch's explanation was within .04 of a day of being exactly correct. Plutarch's ancient Greek sources were solid, and his explanation for the new conditions satisfied his Roman audiences." Plutarch here deals with the Earth shock of 686 BC, but makes the comparison to the year before the Earth shock of 747 BC. Patten and Windsor claim that Plutarch confuses Mercury (Hermes) with Mars (Ares), but there is no confusion of Mars and Mercury by Plutarch. He clearly states that it was Mercury who made the last adjustment in the Earth's orbit. I am not sure if the ancients dealt with orbital periods to the third decimal place. 1/70th seems like an awkward fraction of 360. But in that we do not really know what change in the orbit was made in 747 BC, it is difficult to judge how the 1/70th should really be applied. I have no idea of the correct value for the length of the year during the 60-year period from 747 BC to 686 BC, except to suggest that it was perhaps slightly longer than 365.24 days. This is based only on a curious statement in the Annals of Shu which tells of Yao's calendar efforts, which involved the declaration that the year consisted of 366 days. I'm sure the statement (which has nothing to do with the actual length of the year in 2349 BC) was meant to bring ancient documents up to date. This was also done with regard to the location of the equinoxes. What this suggests is that these "corrections" were made to the texts of the Annals of Shu after 747 BC and before 686 BC. With the change in the heavens in 685 BC, the "corrections" were not again corrected. It was clear at that time that they would have to stand as the record of remote antiquity. The Annals of Shu were compiled, it is estimated, in 700 BC. With the Moon on an odd interval of the year, religious festivals which had been signaled by visible aspects of the Moon, like the new Moon or the full Moon, now drifted around the year. Religious feast days fell 9 or 10 days behind with every following year. Calendars were changed again worldwide. The solutions varied immensely. I have detailed some of these changes in the chapter "Destructions by Mars." A comparison is made below of real time (solar years) and Carbon-14 elapsed time (years of 365.24 days) after corrections. The table below is from the standard "date correction" tabulation currently in use (1998). Of interest is the table's "difference" between actual and Carbon-14 dates, compared with "calculated" dates based on what I presume to be the actual number of days in a solar year. Raw Carbon-14 dates are based on the exponential decline of residual radioactive Carbon-14 in samples of plant carbon (composed mostly of Carbon-12). The raw data thus generates "time" as "365.24-day years." It had been assumed at first that there was a direct relationship between lapsed time as determined by the Carbon-14 measurements and real time measured in current years. This assumed both that the amount of radioactive carbon produced in the atmosphere was constant over time, and that the year has always been of the same length. The residual Carbon-14 in a gram of (mixed) Carbon can be measured by counting the number of electrons released per minute as the Carbon-14 decays to Nitrogen-14. This relationship was shown to be somewhat in error in the 1950s. The uncorrected Carbon-14 results always gave dates later in time (that is, younger) than the actual dates for some well-known (dated) samples. It was concluded that there were periodic fluctuations in the C14/C12 mix of carbon dioxide in the atmosphere. The raw Carbon-14 results at first were corrected by a small percentage for dates prior to 700 BC when certain well-dated artifacts did not yield the correct Carbon-14 dates. Ultimately corrections were made on the basis of the Carbon-14 analysis of tree rings. That solved a lot of problems, for trees do not lie about their age. For dates before about 8000 BC (the oldest tree ring data available) the Carbon-14 tables are based on data from coral cores at Barbados. The tree rings constitute an absolute and indisputable measure of time as a count of solar years, although it says nothing about the length of the year in days. Carbon-14 can be measured for tree rings, but varies with locations and local climatic conditions, of course, and thus yields a range of Carbon-14 measurements for any actual year. As a result we end up with a table where the "actual date" is the independent variable, as shown below, rather than the dependent variable. In the past before 700 BC, all the Carbon-14 derived dates are earlier than chronological dates, that is, younger than the actual dates. This is attributed, as I have pointed out, to variations in atmospheric Carbon-14 levels. But it could also be because the years at various times were shorter, especially before 747 BC. The tabulation below compares my estimates of the number of days in the solar year with the corrected Carbon-14 data. The calculated dates are on the same order as the corrected Carbon-14 dates for the time span of 4077 BC to 747 BC. That is, my calculated date corrections are in line with the fluctuations of the Carbon-14 dating technique. I am comparing my "calculated difference," which represents the complete shortfall in years, against the "Carbon-14 difference," which is only the difference in years between the uncorrected Carbon-14 time and the specific calendar year. The two columns are thus not exactly comparable. For the time before 4077 BC, the calculated dates do not match the corrected Carbon-14 dates if it is assumed that a 225-day year was in use. I would have to conclude that for this prior period the year could not have been 225 days, but was perhaps twice as long. The tabulation below is annotated with the changes in the length of the year. The full "INTCAL98" Carbon-14 correction table lists data at 50-year intervals from AD 1955. I have only shown some selected years which coincide with changes in the length of the year. The original table also includes measures of the standard deviation, which I have neglected in the tabulation below. !! M. Spurk. INTCAL98 Radiocarbon Age Calibration, 24,000-0 cal BP. !! Radiocarbon 40, 1041-1083 (1998). May 2009: revised for change to 3147 BC. May 2015: revised for change to 4077 BC. Comparison is between the two columns "calculated difference" and "C-14 difference, years." The tables use AD 1955 as a base date, so that a conversion to "Solar BP" (Before the Present) from "BC/AD" requires adding 1955. I have shown the INTCAL98 table in reverse order. My calculated dates for the period during which I have postulated differences in the length of the year are mostly in agreement with the corrections of the table, back to 4077 BC. We know of periods during which massive forest fires raged over parts of Europe. The table would account for these, so some of the variation could well be attributed to Carbon-14 variations. The actual table also shows the effects of the Industrial Revolution (not shown here). Similarly, the contacts (smells of perfumes) with Mercury between 806 and 686 BC could have altered the C-14 proportions of Earth's atmosphere at that time. This may be why the calculation by length of the year underestimates the C-14 year data after the 8th century BC. I will assume that Earth orbited about Saturn, rather than the Sun, during all of the Precambrian (3.8 billion to 560 million years ago) and through the Permian (ending 250 million years ago), after which time Earth was captured by the Sun. It is the chronology of the Precambrian I want to discuss here. Simply stated, it looks as if both the geological changes and the biological changes occurred at 600 million to 700 million year intervals. Assuming that the biological advances (increases in complexity) require the catalyst of a massive plasma contact, I'll assume that Saturn went nova at approximately 700 million year intervals. The first of these might have created the Earth in a mass expulsion 3.8 or 3.9 billion years ago (bya). A table follows. I am using dates for the Canadian Shield because it is the most studied. Sedimentation and lava are first noticed in geological formations dated 3.8 to 3.2 billion years ago. This seems to indicate that the Earth possessed winds and water from a very early time (volcanoes produce water). The numbers in parentheses, above, show the intervals between periods of geological activity or the start of biological periods. I have extended the tabulation to the era of "creation," 4077 BC. The date of 3.9 or 3.8 billion years ago marks the "birth" of Earth. The end of the first interval of 0.7 billion years is marked by the first signs of prokaryotic cells appearing at about 3.1 billion years ago. The average interval through all of the Precambrian is 680 million years (counting the last two intervals before the Cambrian as a single interval of 0.76 billion years). After that the interval between mass expulsions (nova events) decreases, and in fact the shorter interval appears already before the Cambrian. I may actually be misreading the interval, first because the creation of the Moon seems to be dated to 4.3 bya and thus 400 million years before the birth of the Earth at 3.8 or 3.9 bya, and not at the expected 700 million year interval. This would be significant if the Moon is a Saturnian planet. Secondly, I have excluded from the list above an event dated at 3.4 bya, which would also decrease the earlier interval to 400 million years. The concluding date for the Precambrian is 0.57 bya (570 million years ago) -- the start of the Cambrian. This is a matter of nomenclature, although it is generally held that this date follows on another massive disturbance. Otherwise there is no sharp division between the two periods. The Cambrian is defined as the sudden appearance of organisms (fossils) with hard body parts. When I first looked at the above table I suddenly had the realization that Saturn might be due for another nova event right about now. Then I realized that this had happened already -- in 4077 BC. The extinction at the end of the Permian, 250 million years ago, has been well established for marine biology -- 99 percent of marine species were lost. More recent research has established that this was accompanied by seven land-based upheavals (during which 95 percent of land species went extinct). The data encompasses South Africa, China, and some other locations, and is spread over an estimated tens of thousands of years. This matches my earlier proposal that it would take 15,000 years for Saturn to enter and again exit the Sun's plasmasphere (biologists suggest 10,000 years for the duration of extinction events). This long land-based Permian extinction has all the marks of a nova event. From biological considerations, it is probable that Earth was still in orbit around Saturn through the Permian. The extinction at the end of the Permian also looks like it is the result of a series of equatorial strikes and perhaps a continuous immersion of Earth in plasma flows. The date of the Permian extinctions fits well with the decreasing intervals between nova events, which had halved (from 700 million years to 440 and 320 million years) already before the Cambrian. The meteorites identified as "Martian" (the SNC series) have a solidification date of 3.1 bya. Moon rocks are generally dated to 4.3 billion years ago (but also to 3.1 bya), which hints at the Moon's Saturnian origin by having an age displaced from the age of Earth or Mars by a multiple of 400 million years. The separation dates of meteorites (as different from the "solidification dates") are based on a method of radiometric dating which depends on the supposition that meteorites have been subjected to a constant bombardment of high energy Gamma rays from outer space (which come from beyond the Solar System, and thus is constant) since their separation from a parent body, thus transmuting some of the elements, which can be measured. These tests yield "separation ages" -- the time when the parent body of a meteorite broke up. There is an interesting coincidence of the separation ages with other events I have proposed. The separation ages of chondrite meteorites -- 3.2 million years ago (mya) and a tail to 40 mya -- coincide, or precede, the extinction (and glaciation) of 30 million years ago and the glaciation of 3 million years ago. The Martian SNC meteorites have separation dates of 11, 2.6, and 0.5 million years ago. These would seem to correspond to the earliest evidence of northern glaciation (11 mya) and the well-defined start of northern glaciation (2.6 mya). The separation date of 0.5 million years ago may relate to the start of the most recent glaciation. It is of course uncertain how these separation dates of rocks from Mars relate to a history of the Earth, unless it were to be assumed that Mars had already been captured by Saturn as early as 11 mya. I would thus have to suggest that the separation date of 0.5 mya might represent the capture of Mars by Saturn, and that the cup-and-tail markings of the Upper Paleolithic could have been extended much further back than 40,000 years in time -- 500,000 years into the Middle Paleolithic where only Homo erectus was the constant witness. There are problems with dating, for it is held that the Solar System is 4.7 billion years old, and the dates of all meteorites and planets are arranged to asymptotically approach this figure, even when this is illegitimate. Older dates are preferred as representative of the age of a planet. For example, the age of the Moon is held to be 4.3 billion years, yet the rocks brought back and analyzed came in at 3.2, 3.7, 3.8, 4.2 and 4.6 billion years. At best this data would suggest that parts of the Moon's crust were still boiling out liquid magma more than a billion years after its creation, which is unlikely. Astronomical years use the Julian calendar backwards from circa AD 1500, but use a year "zero" to fall before AD 1. Astronomical years in the previous era are thus equal to Julian calendar years less one year. For dates in the previous era the astronomical calendar uses signed years, like "-747" -- which would actually represent 748 BC on the Julian calendar. Julian years are based on the assumption that the solar year is 365.25 days long. It accounts for the 1/4 extra day per year by introducing a leap year every four years. There is some shuffling back and forth in placing dates at the exact time of the solar year because some years are longer or shorter by a single "leap day." The Julian calendar had been in use (as mandated by Julius Caesar) from about 40 BC (but correctly only since about 5 BC) to about AD 1500. Julian years are slightly longer than Gregorian years, and start to move a day or so further into the past every 400 years from about AD 1500 (from an initial divergence of 10 day). A Julian calendar is used in astronomy and, when used for the previous era, is based on a "Julian Day" count which was developed in the late 16th century AD. The Gregorian calendar has been in use since about AD 1500, and accurately places all dates in the proper season of the year, although with some displacement of dates like the Julian calendar due to leap days. To stay in sync with solar years, the Gregorian calendar neglects (skips) a leap day every 400 years. Julian years and dates, which tend to drift backwards in time, can be converted to equivalent (backward extended) Gregorian dates. This will place the dates in the proper season, which generally is my only concern. The Julian to Gregorian conversion routine which I am using recalculates the Gregorian year dates for every year in the remote past based on the extrapolation of various celestial parameters. The conversion should be very close to actual equivalent days in the solar year, as long as the seasons and the length of the year have not changed. Of course, the seasons changed after 685 BC and the length of the year changed in 747 BC (and at a number of other times in the past). Because the extended Gregorian years of the conversion program are recalculated each year, it is reasonably accurate as an indicator of where a day in the year would fall even when used for years in the past before 685 BC or 747 BC. The Gregorian year can be apportioned over a year with fewer days. The Eastern Mediterranean chronology is based mainly on the Babylonian Chronicles (the "Era of Nabonassar"), and used extensively by astronomers since the time of Ptolemy. But it is four years advanced over astronomical chronology. This is easy enough to correct most of the time by subtracting four years. This correction is apparently not needed before about 700 BC, or dates after the Roman era. Babylonian dates are based on calendar months of uncertain lengths, although historians assume some variation in calendar month lengths which would average to the lunar month. Extra months were intercalated since 747 BC. Most other nations in the surrounding region probably used either the Babylonian months (and certainly in the area-wide regionalization by the Assyrians after 740 BC) or attempted something very similar. I would expect that the Babylonians suddenly and inexplicably intercalated an additional month after the Venus nova event of 685 BC, to bring the start of spring (the vernal equinox) into the correct month. There are Jewish records also of doubling up on a month sometime in this era. The Egyptian calendar remained uncorrected, and after 747 BC three separate calendars were in use. One is a religious Venus calendar of 360 days. Another is an administrative calendar of 365 days. And the last was a lunar agricultural calendar. We know almost nothing about any of these. On the basis of statements found in the Canopus Decree of 291 BC it can be suggested when the Egyptians considered a change from a 360-day calendar to a 365-day calendar. See the "Canopus Decree," Appendix I. The Chinese used a series of 60-day periods, within which lunar months, and the day of a lunar month, are identified. Dates from these sources have been successfully converted to Julian or astronomical dates in the 19th century AD. Since 747 BC these would have been completely correct. During the 700 years before 747 BC the seasonal dates would have been off by under 2 days if it were erroneously assumed that the lunar months were 29.5 days. Dates based on the Maya Long Count (retrocalculated) are also correct to the Gregorian calendar, except for dates before 747 BC when derived by the Maya or by us today. But this last is easy to correct, since the error is an obvious incorrect assumption about the length of the year in the past. If a "tun" is a year, held to be 360 days (by the Olmecs) before 747 BC, then the difference between our chronology based on extending the current Gregorian years back in time and the Olmec representation, is only a matter of a difference of 5.25 days per year for the period before 747 BC. This amounts to a difference of 34 years to 3114 BC. The correct date for the end of the "Era of the Gods" as retrocalculated under these assumptions is thus 3148 BC. But there is more. Besides the error in retrocalculated dates it seems clear that when the Long Count was established in 747 BC, the intent was to represent the past in 360-day Tun years. The five extra days of the revised Haab were not part of the tally. Additionally, if the Olmecs in 747 had meant to just count days in groups of 20s, then the Tun would have represented 20 Uinals (months). Instead, the Tuns are 18 Uinals -- 360 days. Thus the 6 Baktuns which were added to the count of 0.0.0.0 were meant to represent Tun years of 360 days, under the supposition that the Tuns had always been 360 days long. The erroneous assumption of 360-day years extending back infinitely can be bypassed by using an "indeterminate Tun" instead. A Tun is a Tun is a Tun, which is a solar year, and the number of days in a Tun does not matter as long as the record of the past used Tuns, not days. This was certainly the case before February of 747 BC (as it certainly was at the time of the Spanish invasion). If we then subtract 6 Baktuns of 400 Tuns (solar years) from 747 BC, we arrive at a true starting date of the current era of 747 BC - 6 * 400 = 3147 BC. In April of 2009 I changed 400 instances of 3114 BC in these texts to 3147 BC. "MS in Sumerian on clay, Babylonia, 2000-1800 BC, 1 tablet, 8,1x6,5x2,7 cm, single column, 26 lines in cuneiform script." "Context: 5 other copies of the Antediluvian king list are known only: MS 3175, 2 in Oxford: Ashmolean Museum, one is similar to this list, containing 10 kings and 6 cities, the other is a big clay cylinder of the Sumerian king list, on which the kings before the flood form the first section, and has the same 8 kings in the same 5 cities as the present. A 4th copy is in Berkeley: Museum of the University of California, and is a school tablet. A 5th tablet, a small fragment, is in Istanbul." "Commentary: The list provides the beginnings of Sumerian and the world's history as the Sumerians knew it. The cities listed were all very old sites, and the names of the kings are names of old types within Sumerian name-giving. Thus it is possible that correct traditions are contained, though the sequence given need not be correct. The city dynasties may have overlapped. It is generally held that the Antediluvian king list is reflected in Genesis 5, which lists the 10 patriarchs from Adam to Noah, all living from 365 years (Enoch) to 969 years (Methuselah), altogether 8,575 years." See the section "Parallel Histories" for my reading of the ten Biblical patriarchs. There is a comment by Suidas, a Greek lexicographer of the 10th century AD, who notes that "Saros" meant 222 lunar cycles of 30 days -- a period of 18 years and 6 months on a 360-day calendar and thus 6660 days. This is the cycle of repetitions for the location of the Moon. Even if the "sars" in the original are taken to have the value of 6660 days suggested by Suidas, the reign years and totals fall into the same range of values as my calculations (see the text), although with double the values. It would change the reign of Alorus from 720 to 1332 years, and the total reign of the 8 kings on Earth from 1072 to 1983 years. Mars's northern hemisphere is marked with eight gigantic electric blisters (named "mons" or "tholus"), but no "meteor impacts." The blisters are the result of sustained lightning strikes. That the eight blisters correspond to eight kings before the flood is likely to be a coincidence. The largest blister, Olympus Mons (three times as high as the Himalayas), shows some five separate melting pools. Eridug -- is the city of the water god Enki/Ea, probably Eri-dugga, "good city." This is (could be) the cloudbank at the northwest horizon. Bad-tibira -- Dumuzid was its tutelary deity. Dumuzid is known as the shepherd, Mars, who guides the dead up the stream of plasma. Larag -- dedicated to Pabilsag, the god of trees. This is the trunk of the tree (and occasionally looking like a leaved tree) between the cloud bank and Saturn at the top. Zimbir (Sippar) -- its tutelary deity was Utu (Semitic Shamash), the sun-god, Saturn ablaze at the top of the stalk. Curuppag (Shuruppak, Uruppak) -- The last king of Curuppag was the hero in the flood story, Ziusudra, the Sumerian Noah -- Shuruppak was dedicated to Ansud, the Goddess of grain. This not only represents the terminal event, the flood, but also the tufts of grain seen waving on the surface of Saturn. The source of these readings is from L.C. Geerts, [www.earth-history.com]. I have added the references to the polar apparition. This suggests that the list of the "kings before the flood" is a later composite of information from diverse sources. The number of the kings probably holds true, for they match the "mythological" records of Mesoamerica, but the names of the cities were added from a description of the polar apparition. There is also "mythological" information from Sumer that Seven Ages expired before the flood (I can't source this, but Geerts mentions it). "Seven Ages" matches information from Mesoamerica, and probably represents much earlier ages dating back to 40,000 BC. Prefaced with, "In the translation below, mss. are referred to by the sigla used by Vincente 1995; from those listed there, mss. Fi, Go, P6, and WB 62 were not used; if not specified by a note, numerical data come from ms. WB." "She" is also listed (or translated) as a "barmaid" and as a "prostitute." "She" is probably the planet Venus, but cannot be dated with certainty to the destructive appearance of the planet in 2349 BC, Her "reign" seems to predate Sargon's conquest of Mesopotamia, which was started after that date. The fact that she is associated with alcohol would date her to 2349 BC, for in both Canaan and Egypt the blood baths (the fall of the Absu) are associated with enraged Goddesses in association with alcohol. The "100 years" is probably 104 years -- two of the 52-year cycles of Venus. Archaeologists date Ku-Bau at circa 2400 BC, and as the only representative of the third dynasty at Kish. Puzur-Sin, the son, however, is estimated by archaeologists at circa 2360-2340 BC, and Ur-Zababa, the grandson at circa 2340 BC. Inconclusive as this is, although suggestive of the celestial beings Venus and the Moon ("Sin"), her son, it would place the barmaid and alcoholic Ku-Bau at 2349 BC. There was no Moon until after 2349 BC. So, although there was a Moon at the time of the Isin compilation (after 2017 BC), there was no Moon during the earlier Dynasties. I do not know where the "3 months and 3 1/2 days" comes from. The 3 1/2 days seems like a reference to the reappearance of Jupiter after the fall equinox of 2349 BC (actually 2 and a half days), at which the 3 months could have represented the period before that when the plasma mountain outpouring of Jupiter was missing. This is speculation, although even the Chilam Balam reports that Jupiter (Bolon-ti-ku) was not "crying" when the Moon showed up -- in 2349 BC. Similarly, the Babylonian creation myth, the Enuma Elish, reports on the disappearance of the garment of Marduk (Jupiter) directly before he wars with Tiamat. This would not have been reported, I feel, unless there was very little time between its disappearance and its recovery. The garment is a skirt, the mountainous outpouring of plasma below Jupiter. The Sumerian numbering system was a place-value system like our decimal system, but using column values of powers of 60 (we use powers of 10). But since there was no symbol for empty columns until Babylonian times, it was impossible to differentiate, for example, the meaning of two adjacent wedge marks in cuneiform. It could have a value of 2, or 60 + 1, or 3600 + 1. Cuneiform developed from an earlier pictographic script sometime circa 2500 BC. The numbering system in use at that time also used very similar symbols for units and values of 60. Mercury today circles the Sun at the Sun's equator, and its orbit is thus the furthest removed in inclination from the orbit of Earth. It is also on the most eccentric orbit, and with the shortest period. It is difficult to conceive of this planet ever coming anywhere near Earth. But it is certain that initially, after 3067 BC, its orbit was equal to that of Mars. In 686 BC, Mercury made an electric field contact with Earth. It got walloped with a repulsive electric shock, probably on an approach to Earth from the direction of the Sun. This bounced Mercury backward into a much smaller orbit, and at zero degrees inclination to the Sun's equator. The following year Mercury blazed along with Venus. There are perhaps other solutions to unraveling the King List of Kish. Wikipedia notes that the second entry, "Kullassina-bel," may actually be a sentence in Akkadian meaning "All of them were lord." Readings like this may apply to the next 9 names. The names of the next nine kings of Kish (preceding Etana) are all Akkadian words for animals, e.g. Zuqaqip "scorpion" (says Wikipedia). There is an archaeological basis for En-me-barage-si, second to the last king in the list. Of Etana and the following kings many have names which appear in the earliest stories and myths. Archaeologists place the first king on the list at about 2900 BC, on the basis of no evidence except the need for normalcy. I would place the first king of the list at 3067 BC, not at 2900 BC. It could be suggested that the nine "animal" names are equivalent to the Egyptian pre-dynastic kings with names like Scorpion, Crocodile, and Catfish Chisel. If these are discounted from the list, then, starting with Etana there are only 10 kings left (plus the last king, Aga). This would be fully in expectation of finding a list of ten appearances of Mars over a 300-year period. As another example, although this differs from interval counting: After 40 BC Julius Caesar instituted the Julian calendar, which included a provision for a leap day to be added every four years. The Roman Senate, however, started to add a leap day every three years, a mistake which was not recognized for 36 years. The error came about from the Roman practice of counting years inclusively, so that the first year of a span of four years was the same as the last year of the previous span. "A method still in use during the 20th century in the Middle East uses the thumb to point to different parts of each finger [the three finger bones]. Each finger can be used to indicate three numbers, so the four fingers of one hand cover the numbers 1 to 12. This produces the number 12 as an alternative base for a "natural" number system, known as the 'duodecimal system'." "A logical extension of the duodecimal system is the 'sexagesimal system', which uses the base 60. It uses one hand to count from 1 to 12 and the other hand to indicate the multiples of 12." If the thumb of the other hand is used to point first to the palm and then to the tips of fingers to tally the counts of 12s made by the other hand, then a total of 60 can be counted. Tomczak notes that this system, or something like it, is still used at stock exchanges. The duodecimal counting system can also be derived from a method of counting which imagines each finger of a hand as falling in the space between objects to be counted. A single object is not counted. One finger represents two objects, two fingers counts three objects, etc. A dozen is represented by two hands. A perusal of Maya glyphs immediately turned up the figure above, where a closed fist with one extended finger stands for the cardinal number "two" (Website of John Montgomery). I doubt if there will be others representing "three," "four," etc. An image of a thumb is used in some glyphs to represent the number one. We teach our children the one-to-one correspondence of fingers and objects, and it is so ingrained from an early age that most of us cannot imagine any other method of tallying objects. Ask any two-year old how old she is and she will hold up two fingers. But at her age it is a symbol, not an enumeration. I have had three-year olds disagree with me when I held up three fingers to denote their age because I included my thumb -- they were not the correct fingers. Still in use in Pakistan (one of my neighbors tells me) is an almost identical method of counting to 16 on one hand, using the tip of each finger and the joints -- thus 4 counts per finger. This leads to a count of 32 on two hands. It is possible that the sets of 32 stones set up at Western European barrows represents such a counting base (like our base ten) or that it just meant "a lot." The same can be derived by counting the tips of four fingers with the thumb, and then the base, for a total of 8. The counts of 8s can be tracked with the other hand in fingers: 4 fingers is a count of 32. I have earlier suggested that both the axe (or torch) in the head of Mars and the mirror on his forehead could easily date to the period of 800 to 685 BC. The axe in his head probably represents the lightning strike by Venus, which could be placed in 776 BC. The mirror, often depicted as a smoking mirror or a mirror inset with a torch, clearly is the northern ocean (or the remnant of the included deeper ocean, Deuteronilus) steaming water vapor into space. This would account for some of the strange Mesoamerican depictions of Mars. It seems likely that the sublimation of the last ocean of Mars continued into the current era. "The initial section deals with kings before the flood and is significantly different from the rest. When the kingdom durations of the antediluvian section are expressed in an early sexagesimal numerical system, all durations except two are expressed as multiples of 60^2. A simple tally of the ciphers used yields six 10x60^2 signs, six 60^2 signs and six 60 signs." "The lives of the biblical patriarchs, however, have a precision of one year. If Adam and Noah are not included (as in the King List), and the lives of the patriarchs are similarly rounded to two digits, the sum of the lives has six 10^3 signs, six 10^2 signs and six 10 signs. In addition, if the number representing the sum of the ages was wrongly assumed as having been written in the sexagesimal system, the two totals become numerically equivalent." "This traditional account of Roman history, which has come down to us through Livy, Plutarch, Dionysius of Halicarnassus and others, is that in Rome's first centuries, it was ruled by a succession of seven kings [starting with Romulus]. The traditional chronology, as codified by Varro, allots 243 years for their reigns, an average of almost 35 years, which, since the work of Barthold Georg Niebuhr, has been generally discounted by modern scholarship." "The Gauls destroyed Rome's historical records when they sacked the city after the Battle of the Allia in 390 BC (Varronian, according to Polybius the battle occurred in 387/6), and what was left was eventually lost to time or theft. With no contemporary records of the kingdom existing, all accounts of the kings must be carefully questioned. The list of kings is also of dubious historical value, though the last-named kings [two Etruscan names] may be historical figures. It is believed by some historians (again, this is disputed) that Rome was under the influence of the Etruscans for about a century." Ussher lists Abraham as born 352 years "after the flood"; Josephus has Abraham born 292 years after the flood. This last figure also seems to recapitulate the 300-year span of kings at Kish, neglecting the initial 80-year period after the flood when there were no kings. But I think that Abraham should be identified with Jupiter rather than Mars. These calculations involve playing along with the inadvertent errors promulgated by the editors of the Bible in making their analysis. Peter A. Piccione, at the University of Charleston, SC, uses the following for course material. I have added the numbering and reign lengths. -- Source: P. A. Piccione, University of Charleston, SC. Other sources date Aha to 3000 BC. Occupancy of these sites dates to 3100 BC. Thus the pyramids start 400 to 500 years after the local people first start using the sites. This is no different from Egypt and Mesopotamia. In all cases construction of pyramids does not happen before 2700 BC. Senmut is dated to about 940 BC in the revised chronology of Velikovsky. For an analysis of the images see Ove Von Spaeth "Dating The Oldest Egyptian Star Map" Centaurus V42 (2000). Von Spaeth notes that the rock cut tomb was abandoned during construction in 1493 BC (what a coincidence!). The central portion depicts the circumpolar constellations. The circles represent 12 calendar months of 24 divisions each, for a total of 288 days -- 15 days longer that my estimate of 273 days for the length of the year after 2193 BC. There are other possibilities. Redating to 940 BC is one option. Additionally, since calendars are very conservative, it is possible that the 24-day months are a holdover of an earlier calendar (when there also were 10 months, not 12). It would not be untypical for a religious calendar to retain an older outdated form. A portion of the decans and planets are shown on the bottom. Von Spaeth suggests the planets show a conjunction of all the planets (except Mars) in 1534 BC (under uniformitarian conditions). Later tombs duplicate this arrangement when the conjunction is repeated (with Mars). The conjunction of all the planets marks the start of a "Great Year," although this is a notion dating to the 7th century BC. Tom Van Flandern, various documents in the "MetaResearch Bulletin" series at [www.metaresearch.org], and see his book Dark Matter, Missing Planets and New Comets (1999). Most of this information is from the 15th Encyclopedia Britannica (1984), article "Meteorites," plus an article on "radiometric dating." Ages vary with the reports in use, but as an example of what is being maintained here -- that the Moon is considerably older than the Earth -- note the following quotation from Wikipedia: "The oldest Moon rocks are up to 4.5 billion years old, making them 200 million years older than the oldest Earth rocks, which are from the Hadean eon and dated 3.8 to 4.3 billion years ago. The rocks returned by Apollo are very close in composition to the samples returned by the independent Soviet Luna programme." -- quoted by Wikipedia from James Papike, Grahm Ryder, and Charles Shearer "Lunar Samples" in Reviews in Mineralogy and Geochemistry (1998) and from J.C. Laul and R.A, Schmitt in "Chemical composition of Luna 20 rocks and soil and Apollo 16 soils" Geochimica et Cosmochimica Acta (1973). Note that the difference in ages could be taken either as 200 million years (as was done above) or 700 million years (as I maintain in the text). Size of this page: 28158 words.